On July 4, 2018, the Chinese Academy of Sciences (CAS) officially launched the strategic pioneer program on space science (phase II) at Beijing Huairou Science City. Upon great scientific achievements achieved by Dark Matter Particle Explorer (DAMPE), Quantum Experiments at Space Scale (QUESS), Hard X-Ray Modulation Telescope (HXMT), ShiJian-10 Recoverable Satellite, etc. from Phase I, the program will launch 4 more space science satellites in the next 5 years. The new patch of space science satellites, includes Einstein Probe (EP), Advanced Space-based Solar Observatory (ASO-S), ESA-CAS Solar Wind Magnetosphere Ionosphere Link Explorer (SMILE), all of which has officially entered its engineering phase. Gravitational Wave High-energy Electromagnetic Counterpart All-sky Monitor (GECAM) is carrying out Phase A study, and will enter engineering phase soon. The four missions mainly focuses on time-domain high-energy astrophysics, the relationship between solar magnetic field and solar eruptions, interactions between the solar wind and magnetosphere, the detection of gravitational wave electromagnetic counterpart from gamma-ray bursts. The priority program has also deployed a number of projects including conceptual study, intensive study, pre-research, space science mission planning and data analysis, etc. The Enhanced X-ray Timing and Polarimetry Mission (eXTP) is among the six major projects under intensive research. It is a major international cooperation program led by China and participated by more than 20 countries. With the scientific targets of “one singularity (black holes), two stars (neutron stars and magnetars) and three extremes (gravity, magnetism and density)”, it is designed to observe black holes, neutron stars, and magnetars to better understand the physics in extreme conditions of gravity, magnetism and density. Other projects under intensive study will carry out a series of key technological endeavors in fields such as space gravitational wave detection, origin and evolution law of the universe, birth of the solar system, detection of earth-like planets outside the solar system, etc. Einstein Probe (EP) will perform all-sky monitoring and explore the cosmic high-energy transients. It may shed light on the answers to the questions such as the origin and evolution of black hole population, generation mechanism of gravitational waves, and their effects and life cycle of the first generation of stars, re-ionization, etc. Advanced Space-borne Solar Observatory (ASO-S) will reveal the multiple relationships between solar magnetic field, solar flares, and Coronal Mass Ejections (CMEs). 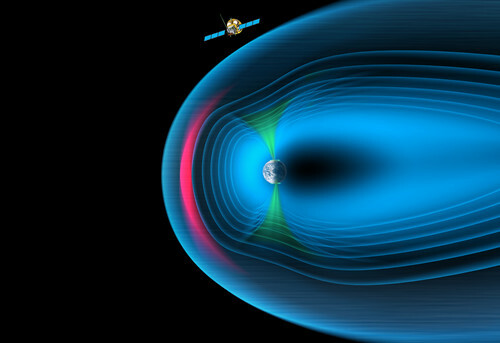 Solar Wind Magnetosphere Ionosphere Link Explorer (SMILE) was jointly proposed and developed by Chinese Academy of Sciences and European Space Agency. It is expected to determine when and where transient and steady magnetopause reconnection dominates, define the substorm cycle, including timing and flux transfer amplitudes, as well as the development of CME-driven storms. With the new soft X-ray Imager and ultra-violet imager as its payloads, SMILE will carry out global imaging of the interaction between solar wind and magnetosphere for the first time. 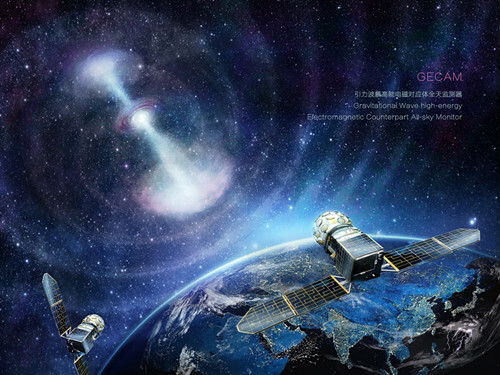 Gravitational Wave High-energy Electromagnetic Counterpart All-sky Monitor (GECAM) is an “mission of opportunity” project proposed for the detection of gravitational wave high energy electromagnetic counterpart in space. With the joint observation by satellites and ground gravitational wave detector, it enables facilitates the discovery of gravitational wave electromagnetic counterpart gamma-ray burst and new radiation phenomena.